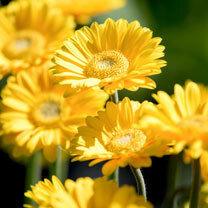 Refreshingly different, these gerberas are a revolution in garden plants. They are not only suitable for growing outdoors, but also hardy, so can stay outside year on year. Robust, bushy and flowering across 3 seasons, why not switch up your usual display! With every new generation of these hardy gerberas, the flowers get bigger and more showy, and the 'Sweet Series' is the best yet. Huge medallion blooms, as big as cut flowered types, and in a sunny range of colours, with almost 100 stems through the season too. Snip a few for indoors and feel smug as you tell your friends you grew them yourself!. Flowers April-October. Height 20-30cm (8-12"); spread 30-40cm (12-16"). Ideal for beds and borders, patio pots and containers. Suitable for cutting. Prefers full sun or partial shade.